In couple of hours time from now, we will say Goodbye to 2008 & Welcome 2009. 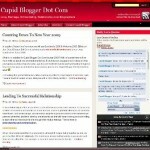 Effective I Jan, Cupid Blogger Dot Com is celebrating its one month old anniversary since it was launched on 1 Dec 2008. I am writing this post in Starbucks coffee overlooking at the tall skyscrapers of Petronas Twin Tower in heart of Kuala Lumpur, Malaysia with a Dark Cherry Mocha Frappuccino while waiting the time to tick and countdown to 2009.
and may this new year brings us happiness, joy and prosperity.